HI SKAGWAY VISITORS, listen up! Here's the straight scoop on airplane glacier tours over Glacier Bay National Park from Skagway. Click Here for Haines Departures! 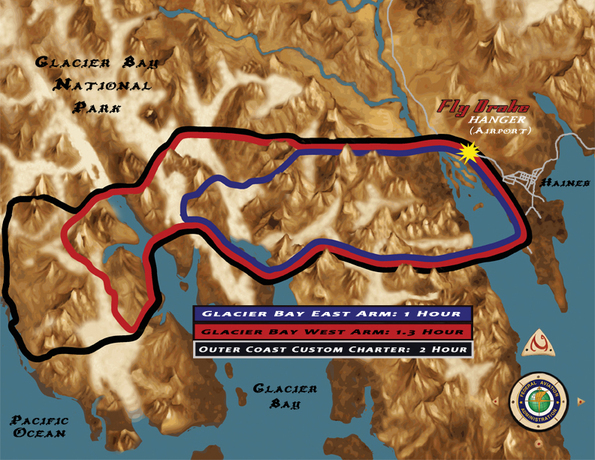 Fly Drake offers premium quality Glacier Bay Scenic Flights from Skagway Alaska. First off Skagway Alaska is very easy to navigate. Boats, Planes, Trains, and the Skagway town are all within blocks of each other. Super easy, depart your cruise ship and walk to the airport..
Glacier Bay Alaska and the surrounding Haines and Skagway areas abound with jagged mountains in a pristine fjord setting that is just simply spectacular. 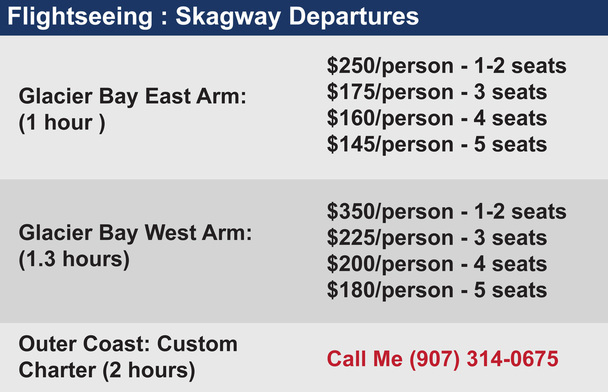 Skagway Flightseeing trips start at the top of Southeast Alaska's inside passage. After departing Skagway Alaska we head down the fjord of the Tiaya inlet and pass over the town of Haines. We fly south to the Chilkat Mountain Range or Takhinsha Mountains entering Glacier Bay National Park. Alaska's Glacier Bay National Park contains over 3.2 million acres of protected land comprising of quickly receding glaciated terrain. Many of its Glaciers reach the Pacific Ocean. ...and I'll offer a remote landing at $25/person if you want to. I recommend it!